875 Adjustable Length Twin-Leg Lanyard. w/6-12 ft Free Fall Potential. 875-12, 6 ft Adjustable Length Lanyard. w/6-12 ft Free Fa..
875-12, 6 ft Adjustable Length Lanyard. w/6-12 ft Free Fall Twin lanyard legs are made from heavy..
812-12 Adjustable Length Lanyards. w/6-12ft. Free Fall P..
812-12 Adjustable Length Lanyards. w/6-12ft. 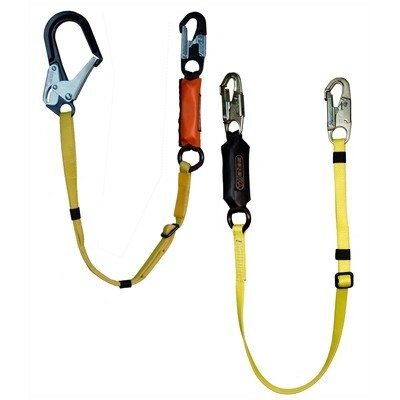 Free Fall Potential 2 1/2" Steel Ladder Hook Single ..
827-12 Adjustable Length Lanyards. w/6-12ft. Free Fall P..
827-12 Adjustable Length Lanyards. w/6-12ft. Free Fall Potential 2 1/2" Aluminiuml Ladder Hook Si..
828 Kevlar Tower/Ladder Lanyard w/ Alum Hooks - 12 Ft. FF..
828 Kevlar Tower/Ladder Lanyard w/ Alum Hooks - 12 Ft. FF Kevlar Tower/Ladder Lanyard is designed..
816-12 Adjustable Length Lanyards. w/6-12ft. Free Fall P..
816-12 Adjustable Length Lanyards. w/6-12ft. Free Fall Potential 3/4" Steel Ladder Hook Single le..
1188 Yates Ladder Carabiner Extensions All..
1188 Yates Ladder Carabiner Extensions Allows the firefighter to attach themselves sa..
874, Flash Rated 6ft (1.83 m) Tie off/Tie-Back Lanyard. 6/12ft Free Fall Potential. 874, Flash Rated 6ft (1.83 m) Tie off/Tie-Back Lanyard. 6..
874, Flash Rated 6ft (1.83 m) Tie off/Tie-Back Lanyard. 6/12ft Free Fall Potential. NEW FR 100% T.. Flash Rated 48 in (1.2 m) Sternal Attachment Lanyard. 6ft Free Fall Potential. Arc Flash Rated 100% Tie Off twin lanyard legs are made f..
Arc Flash Rated 100% Tie Off twin lanyard legs are made from 12mm BlueWater Armortech Rope and 2.5" ..